All smile as he stood in front of the car, ready to go to the Mosque! He had this huge smile plastered on his face the whole time. 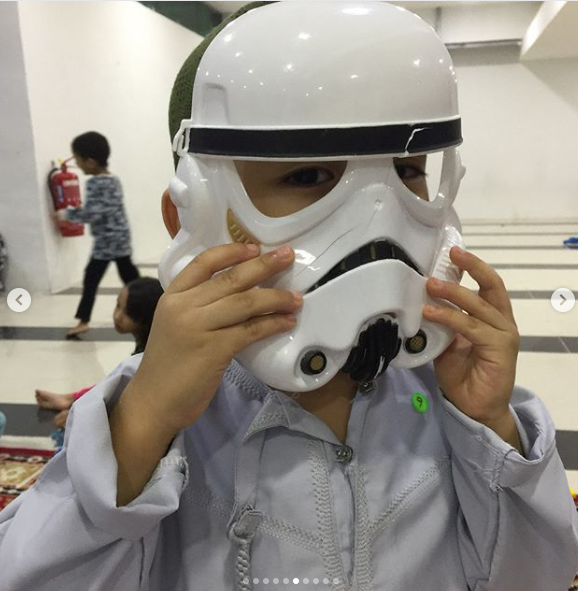 Probably enjoyed the company of newfound friends at the Mosque's Kids Playroom. At some point, he tried to stand next to me and mimicked my prayers (yes, of course I noticed it ðŸ˜…). 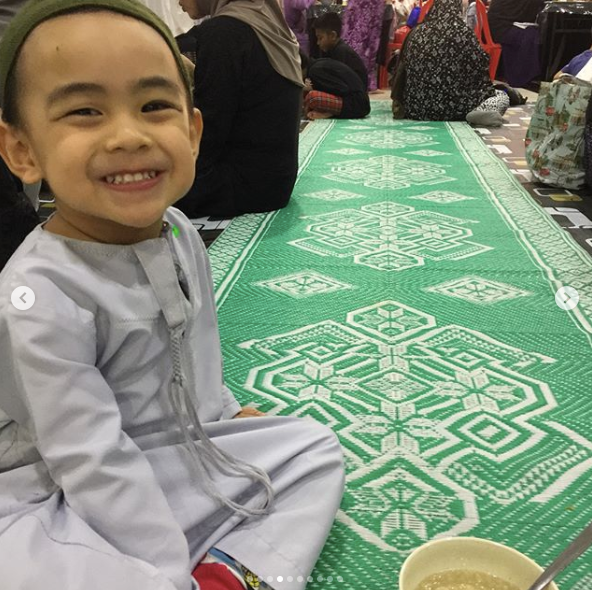 Had his first taste of bubur lambuk too - the smile never left his face. You will discover it is exceptionally full on Friday noon or during Ramadhan only. A seasonal gathering place some would say, and yet ironically some would still skip the Friday prayers because its just too crowded or they feel they have better things to do. Just because an idea is there does not make it right - no matter how prevalent it is in the society. I cant protect you from these ideas. Afterall our time together is defined and it is there only by the mercy of Allah. Eventually you will go through your life without me and you will confront many ideas - the good and the bad - as part and parcel of life. 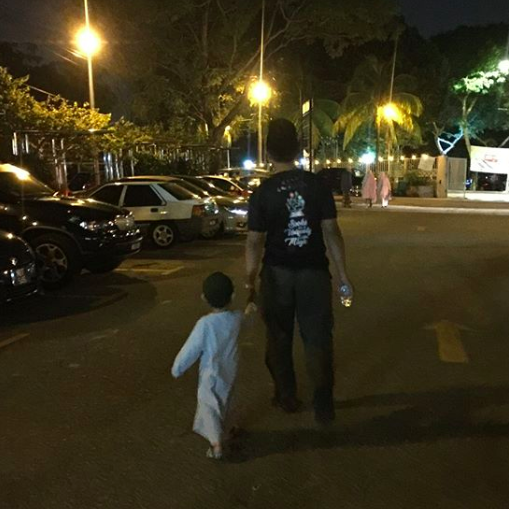 When such time comes, I hope you will look through these old pictures and be reminded of how much happiness a visit to the Mosque brings to this two year old boy. Just remember, the Mosque is what you want it to be. Remember the time when you had no self ego as a kid and how you were able to let your guard down and make new friends at the mosque. Remember the fun you had with Ayah, Ibu, Umi and Ayahsu - the mosque is where you gather with loved ones and it is where you want to be. Remember the first time you discovered Bubur Lambuk - may it continue to be the place where you will learn and discover many more new things. 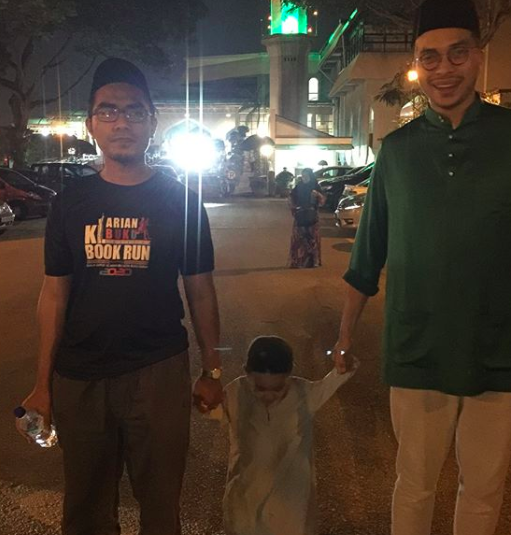 I hope both you and your brother Umar will grow to genuinely love the Mosque. I pray that even long after Ibu is gone both of you will contribute towards making the Mosque to be something bigger and greater everyday - the place where unity, friendship, happiness and companionship are forged. May both of you be amongst those who are promised to be under the shade of Allah for their hearts are attached to the Mosques. Ameen.